Even though Avada (affiliate link) is a multi-purpose WordPress theme packed with a lot of features, it has become pretty well optimized over the years. If your WordPress website runs on a good hosting, and you also optimize other important areas, then the Avada theme won’t prevent your website from having a good loading time. 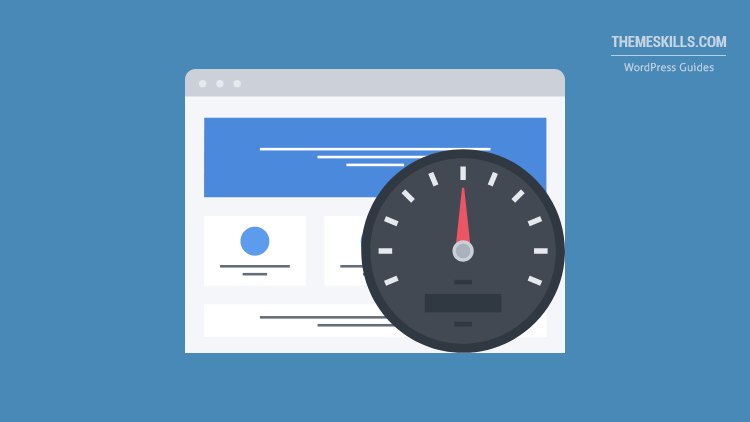 In this post, I’ll only show how to speed up the Avada WordPress theme by tweaking its settings. WP Rocket caching plugin review. Below are the theme settings that you need to tweak to improve Avada’s performance, therefore speed. Basically, you’ll just have to disable a bunch of stuff. Head to Fusion Builder -> Settings and disable all the features that you don’t use, so that Avada won’t unnecessary load them. 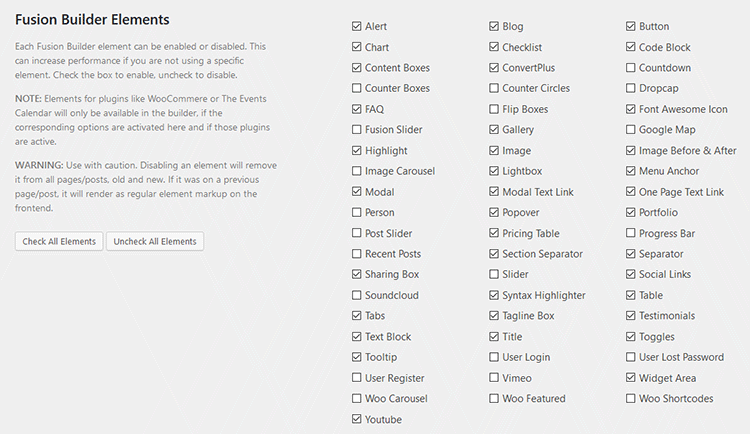 You can also completely disable the Fusion Builder on certain posts types, such as Posts, Pages, Portfolio, and so on. So, if you know for a fact that you won’t use any Fusion Builder elements on your products pages, for example, you should disable it there. I’m not really a fan of sliders and carousels, and if you don’t use them as well, then disable them. Go to Avada -> Theme Options -> Advanced -> Theme Features and disable the Elastic Slider and Fusion Slider. Since you’re there and we’re talking about sliders, scroll up a bit and disable the Avada Styles For Revolution Slider. If you’re using CSS animations, it’s best if you’d disable them on mobile devices. Some animations don’t even work properly on mobiles anyway, such as the ones that are based on hovering. So, head to Avada -> Theme Options -> Advanced -> Theme Features and turn off CSS Animations on Mobiles. If you don’t use CSS animations at all, then you can disable them altogether, even though, usually, they shouldn’t impact the speed if done properly, from what I understand. Go to Avada -> Theme Options -> Advanced -> Theme Features and disable the scripts for the features that you don’t use. APIs usually don’t go along well with speed, so the fewer you have, the better. 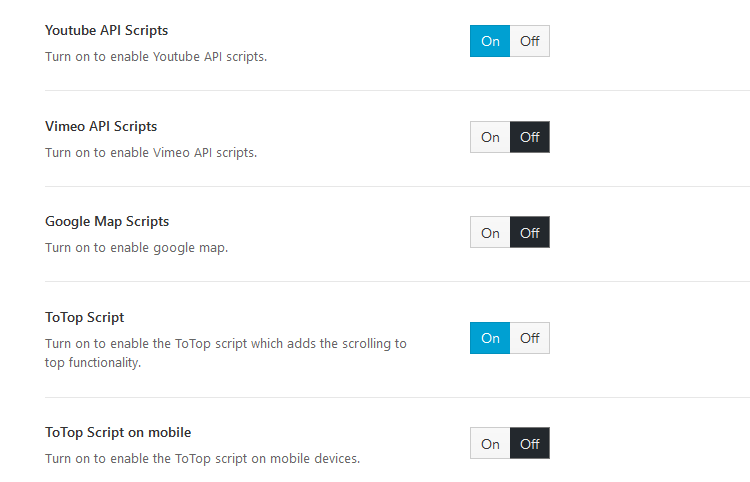 If you don’t use Vimeo and/or YouTube videos, disable their API scripts. I don’t use Vimeo videos, so I only disabled the API script for Vimeo. If you don’t implement a Google map on your site, disable that as well. ToTop scripts are responsible for that arrow that appears on the bottom-right corner of the page or post, which the user can click to go to the top quickly. If your pages/posts are not long, you should disable them. The mobile one is currently disabled by default. I keep the script on for desktops/laptops, but I keep it disabled for mobiles, especially because space is limited there and that arrow appears over the content. Avada implemented this as a GDPR feature, but it’s also useful to optimize the loading time as well. Go to Avada -> Theme Options -> Privacy and set Google Fonts Mode to Local. The fonts will be downloaded on your server instead of loading externally from Google. In Avada 5.8, a lazy loading feature was introduced. Go to Avada > Theme Options > Performance > Performance > Enable Lazy Loading. If you have a Lazy Loading plugin, I recommend disabling it and see if the feature from Avada behaves nicely and you’re satisfied with it. If you are, delete the plugin and use Avada’s feature. The fewer plugins you have, the better! This option was added in 5.8.1, and you can find it in the same place as Lazy Loading, in Avada > Theme Options > Performance > Performance > Emojis script. If you don’t use emojis, disable them. The fewer scripts you have running, the better! “Related posts” are known to impact a WordPress site’s speed. So, to further speed up the Avada WordPress theme, I recommend disabling the Related Posts feature in Avada -> Theme Options -> Blog -> Blog Single Post. Instead, you should use internal linking and/or manually mention related posts throughout your articles. You’ll notice that I have some “related posts” boxes inside the post, which I’ve manually created and manually placed. Here’s how you can create your own “related “posts” boxes using CSS. Loading media-queries files asynchronously is another feature that can speed up the Avada WordPress theme. So, go to Avada -> Theme Options -> Performance -> Dynamic CSS & JS and turn on Load Media-Queries Files Asynchronously. The other settings, CSS Compiling Method (Database) and Enable JS Compiler, should be enabled by default in Dynamic CSS & JS. If they are not, enable them. NOTE: JS Compiler should only be enabled if your server is still using HTTP/1 instead of HTTP/2. Even if you enable it, if Avada detects HTTP/2, it will disable it by default! I hope that you found the post useful and you’ve managed to speed up your Avada WordPress theme! Keep in mind that the theme is only a part of WordPress speed optimization! Hey Thanks for a great article. I tried using the Avada Host fonts locally option but it ended up serving more than 1.5mb of font files instead of the 125kb that it was previously requesting! Did you face this issue? Hello! I’m glad you liked the post! I don’t host fonts locally, but the files can be large, yes. It depends on how many you use, their type, compression, styles (bold, normal, extra-bold, etc.). As a tip theme features is under theme options > advanced > theme features – just took me a while to find as I am not that familiar with the menu. Going to try out all of the above, hopefully with some mobile results (score = 19 atm on page speed insights….). It should definitely improve the speed. And you’re right! I forgot to add the “Advanced” part. Thanks for the heads-up! I’ll update the post right away. I’d wasted some time trying to find these settings to improve performance for Avada, and so glad I found this article! Very well written and very helpful. Keep up the great work! Thank you! I’m very glad that you found the guide useful! Thanks for the great post. It would be useful to notice in your article, what Avada settings are incompatible or undesirable when you using http/2. For Example “Enable Load Media-Queries Files Asynchronously” because hppt/2 also offers asynchronous transfer. I think this applies to the JS Compiler, which is disabled by default by Avada (even if you enable it) if it detects HTTP/2. I’ll mention this in the post. Thanks!